From the moment our babies leave the womb we start documenting their milestones. The first smile, the first belly laugh, and the first time they sit up, along with crawling, walking, and potty training… you name it, and whether it’s baby #1 or #4, parents around the world love to celebrate their baby’s accomplishments even more so than their own. Physically our children are developing rapidly from conception and after birth right before our very eyes. Babies learn more in their first year of development than during any other year in their lives. Just think about it… your baby will learn to eat, smile, roll over, sit up, crawl, and likely even walk all within one year of life. And that is only their physical abilities, not to mention social, emotional, or language development. 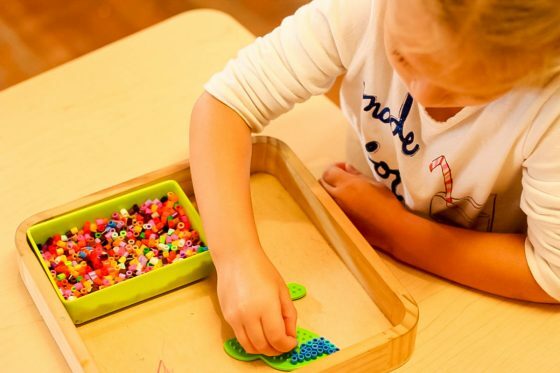 All of these large or gross motor skills, holding the head up, rolling over, sitting up, crawling, and small or fine motor skills, reaching, grasping, and eye-hand coordination, will eventually allow your child to interact fully with the world around them. 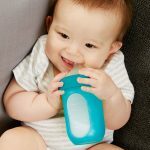 Occasionally even when your baby or toddler is reaching all of the developmentally appropriate milestones, he or she may still be lacking the upper body strength and endurance that will really benefit him or her throughout childhood. 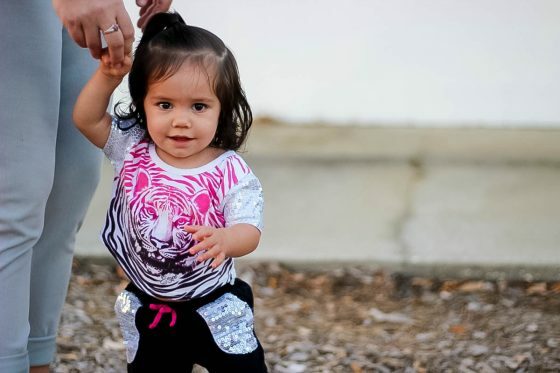 Because our babies eventually walk more than they crawl, and usually aren’t lifting weights or doing push-ups, their upper body strength is less developed. 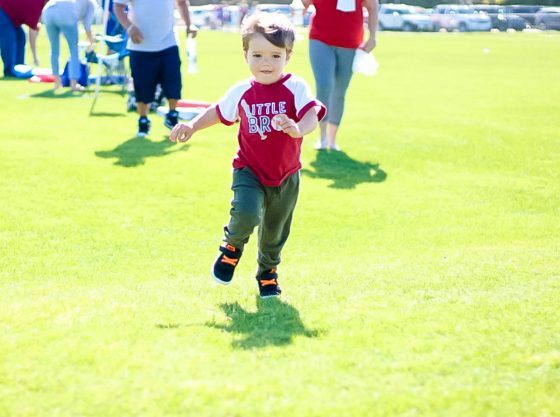 Raising strong kids is not about body-building or endurance-run training, but rather about strength training through play so that fine motor skills and manipulation come easily. 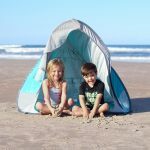 Outdoor play is crucial to developing many of a toddler or young child’s muscle groups. 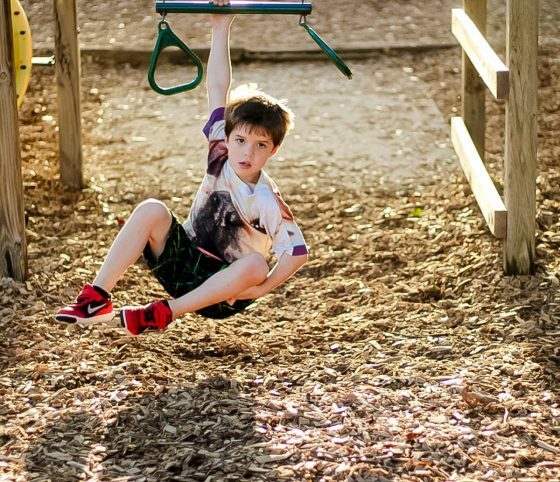 Running, jumping, climbing, swinging, and skipping are just a few of the outdoor activities that allow a child to exercise their large muscle groups, and oftentimes many areas simultaneously. 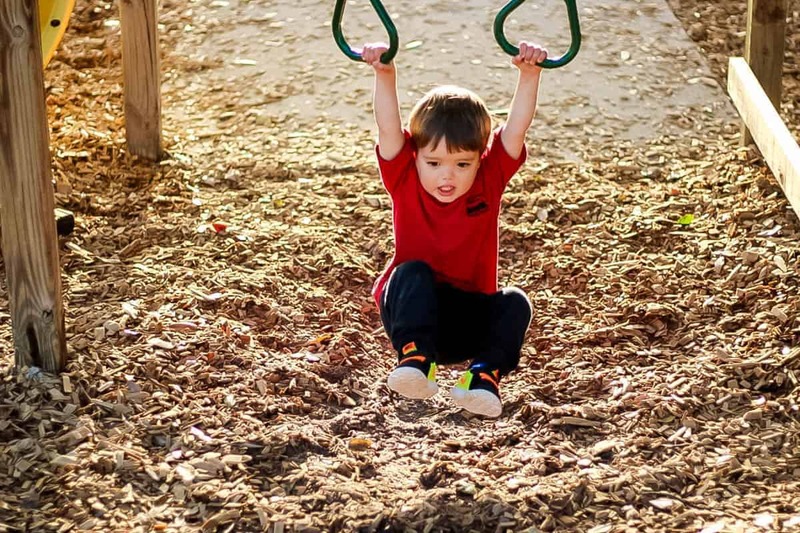 Even activities like skipping involve balance and coordination which come from upper body stability and the swinging of the child’s arms as they play. Strengthening the arms and shoulders comes from arm movement and resistance… i.e. 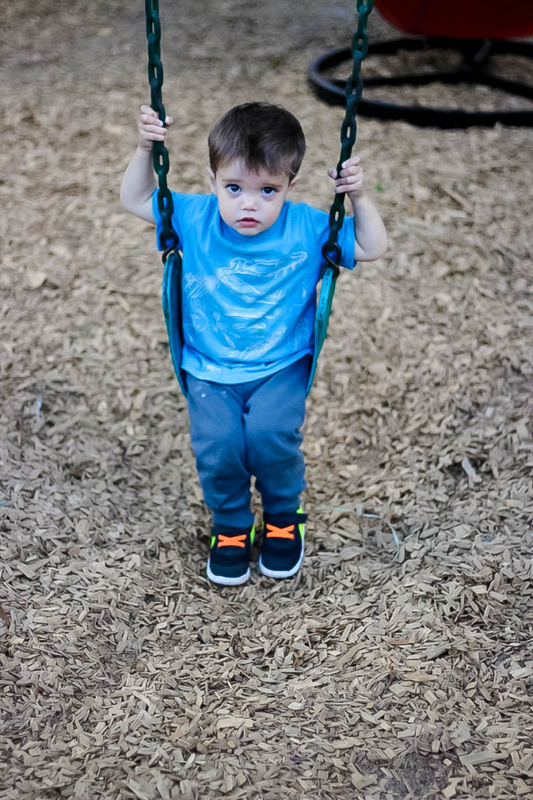 when a child is swinging on their own they are not only pumping their legs, but pushing and pulling back and forth against the ropes or chains. Climbing is a whole body activity that requires skill and movement planning, along with strength and endurance. Muscle tone and postural control are both “exercised” as a child exerts force against resistance in order to pull or push themselves up to where they want to be. 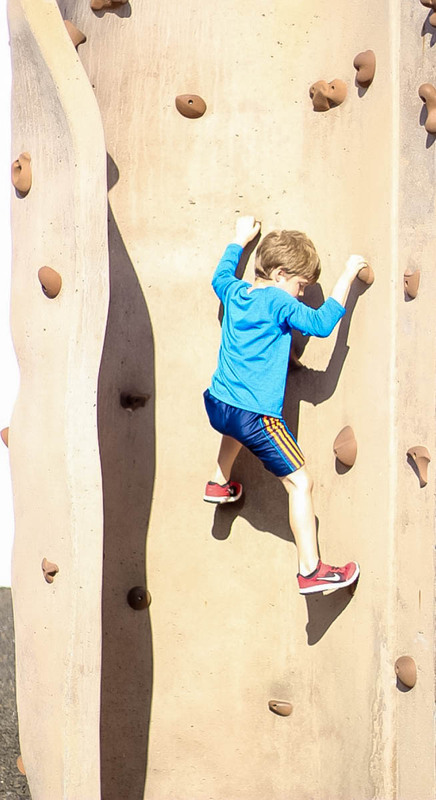 As parents we are so often inclined to discourage climbing (especially indoors) for fear of injury, but in a safe and appropriate space, climbing can have many physical and developmental benefits. 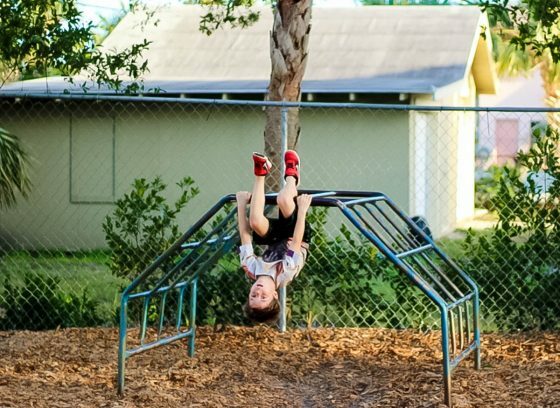 Monkey bars and jungle gyms are great options for increasing a child’s upper body strength and dexterity. 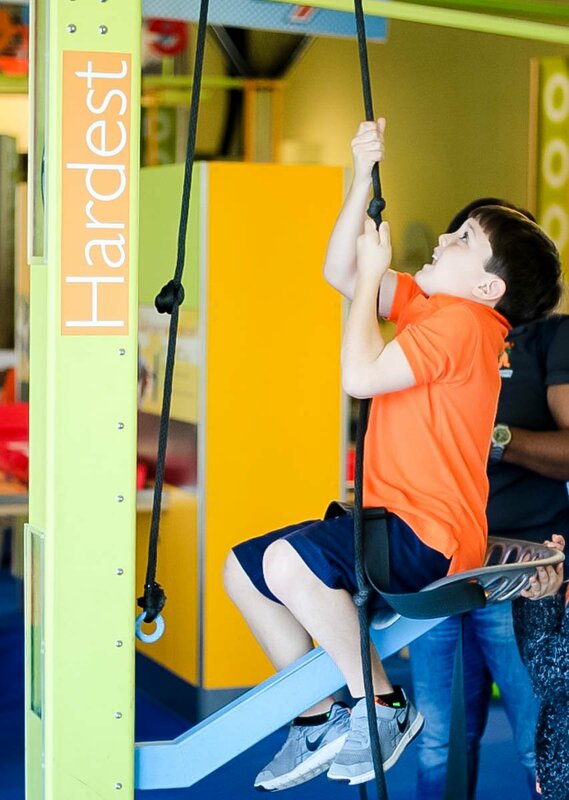 The ability to not only pull up and hold up one’s own weight, but to also move from bar to bar using the weight and momentum of one’s own body is yet again another example of a full-body workout for a child. 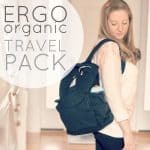 These activities take strength, coordination, and movement planning, thus engaging both the body and the brain. 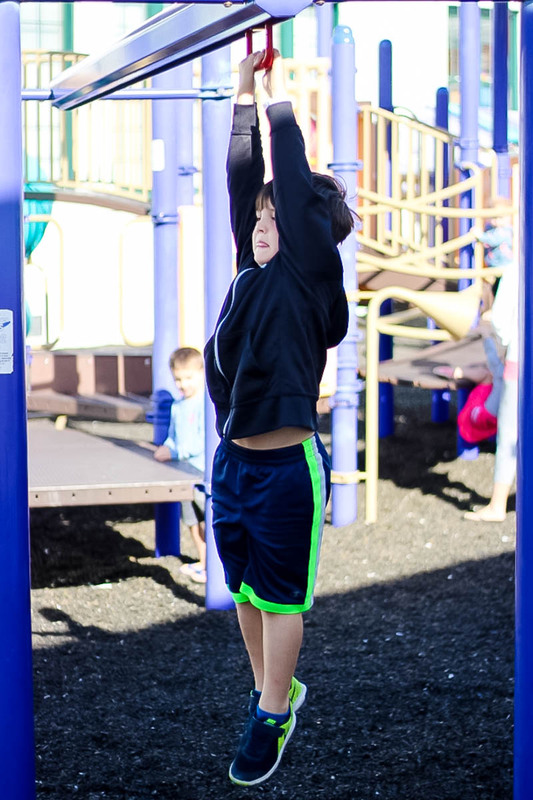 Trapeze bars which are often integrated into large playground structures are also a great way of increasing upper body strength as the child pulls themselves up, or swings on the bar lifting their feet off the ground. Utilizing and exercising the shoulder and upper body muscles is the goal here, which happens as the child pulls themselves up, but also as they swing and manage to keep their grasp on the bar or rings. 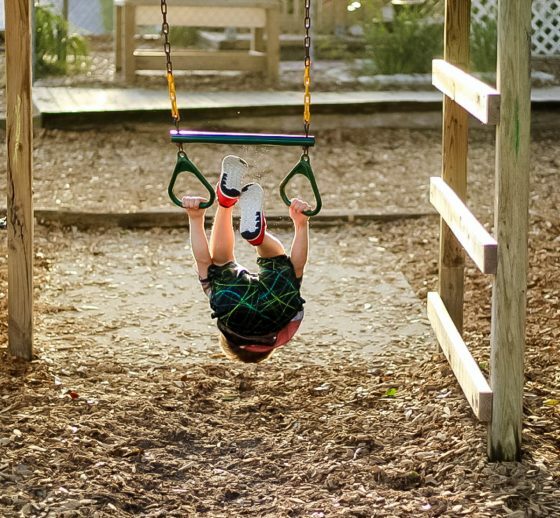 Integrating work with play is the best way for a child to learn, and allowing a child to play outdoors or in a similar, large stimulating play space turns a workout into nothing but fun. 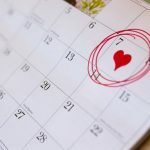 Realizing that not all of us live in year-round tropical climates, or sometimes if you do, you want to spend time in the air conditioning, there are several indoor activities that are fun, engaging, and similarly increase upper body strength. An oldie but goodie is the classic Playskool Sit and Spin. 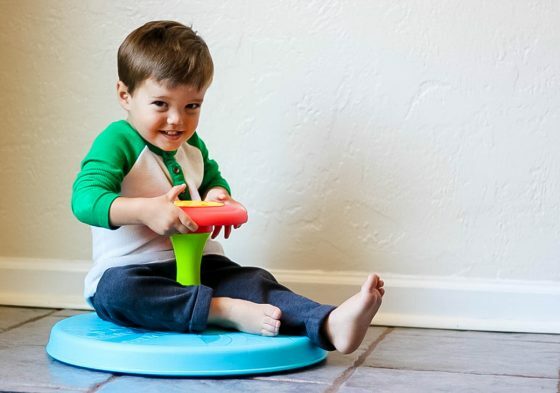 This balance board with stable center handle and spinning seat allows your child to “pull” themselves in order to spin the seat which then whirls and twirls them around in a giddy, laughing epitome of childhood enjoyment. 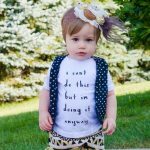 If you’ve ever been to Disney World think of the spinning teacups… although it may take a bit of getting used to, once your child gets the hang of it they will love the dizzying fun of this toy. 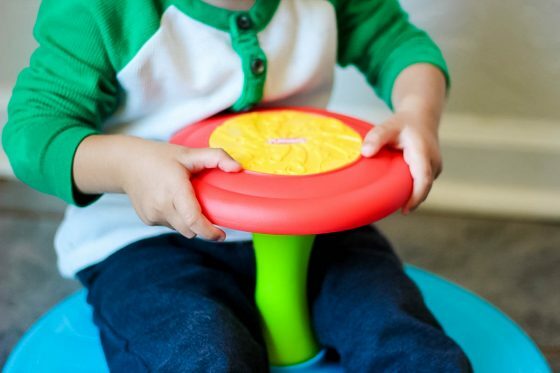 As your child grasps and pulls the center handle they will use their muscles to pull themselves so that the seat itself then spins. This use of strictly upper body and core muscles is a great workout for toddlers on up. 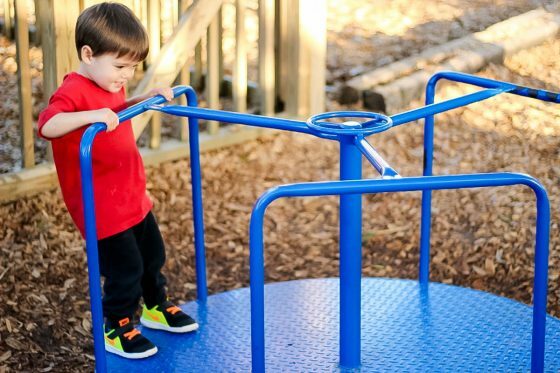 Occasionally playgrounds will even have larger versions, more like a bucket older children can sit in and similarly pull against a center handle to spin, providing an awesome workout. 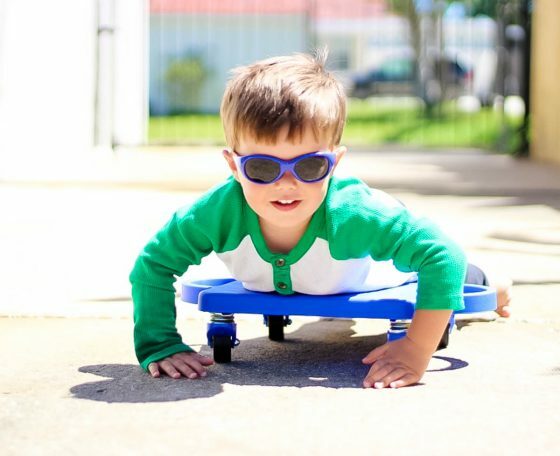 Another great indoor activity for using those shoulder and upper body muscles is a wheelie board. 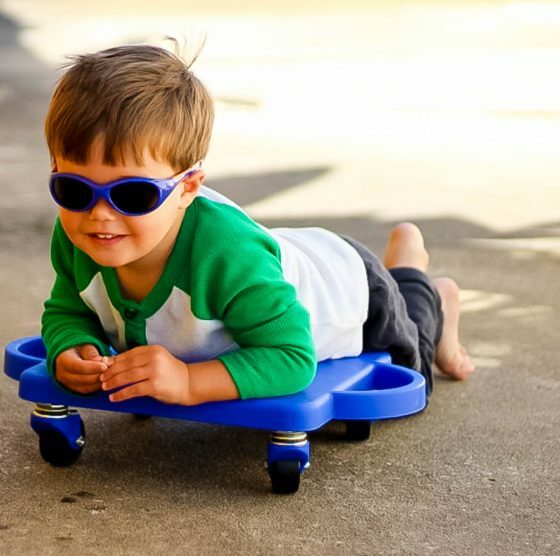 Similar to skateboards but different in shape and use, wheelie boards allow a child to lay on their belly on the board while using their arms to propel themselves around the house. 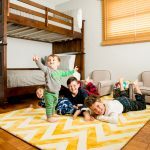 While these can be used in or outdoors, we all know that wood and tile floors make a much smoother and speedier surface than asphalt for an adventurous, fearless tot. Your child will love whizzing up and down the hallways of your house, probably crashing into some walls to be honest, but don’t worry, they don’t go that fast unless big brother is giving them a push. 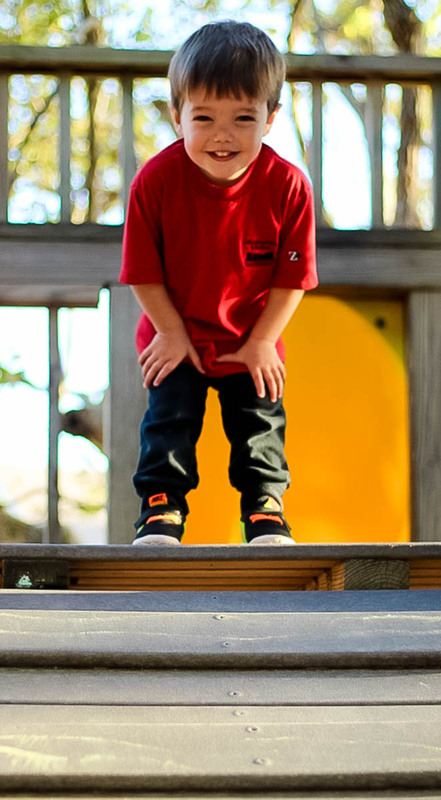 As your child uses his arms to “pull” himself forward on the board, those shoulder muscles will be getting stronger. 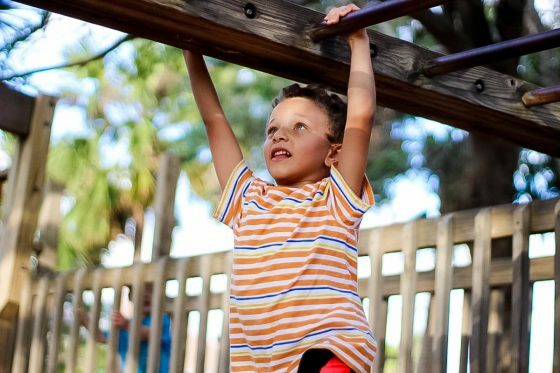 There are even more indoor and outdoor options out there such as gymnastics classes, parallel bars, or pull up bars on playgrounds, but the idea is to get creative and allow your child to play for exercise. Teaching them to enjoy a good, hard, muscle building, strength training workout is a great thing. 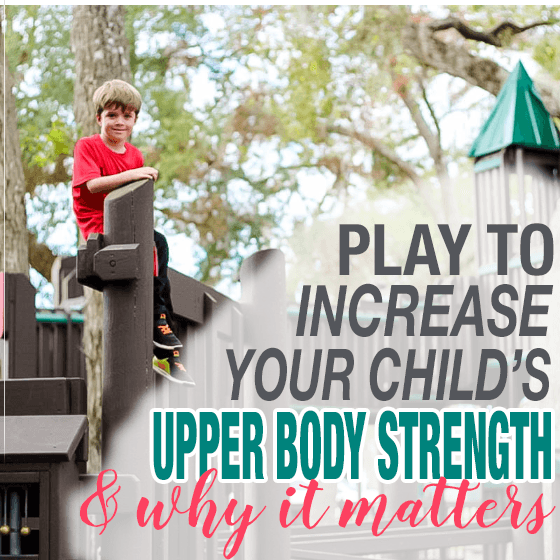 Now you may wonder why upper body strength matters for toddlers and young children? 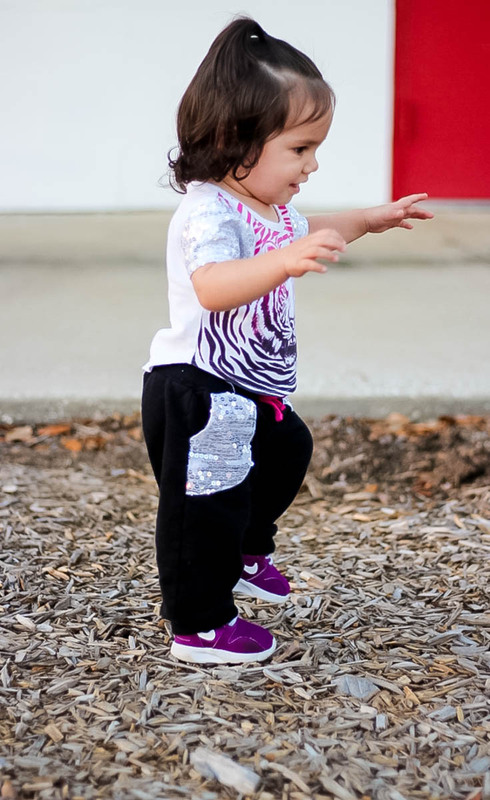 Just as it matters for an infant to be able to workout and develop muscles that allow them to hold their head up, prop themselves on their arms or elbows, and eventually sit up, this upper body strength goes a long way not only in play or sports, but in classroom preparation. 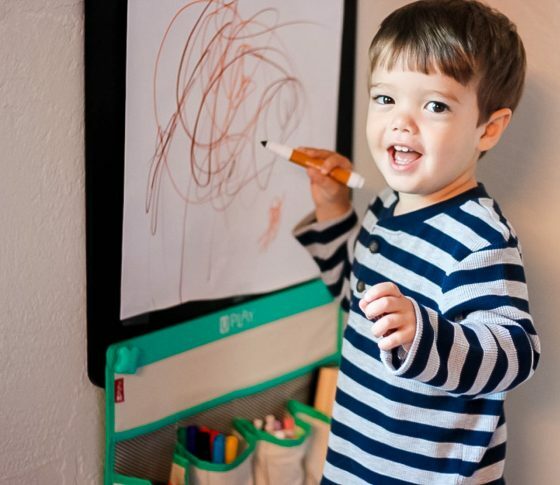 Upper body and shoulder strength matter in crayon or pencil grasp, pre-writing skills, hand dominance, eye-hand coordination, writing, drawing, and fine motor manipulation skills. 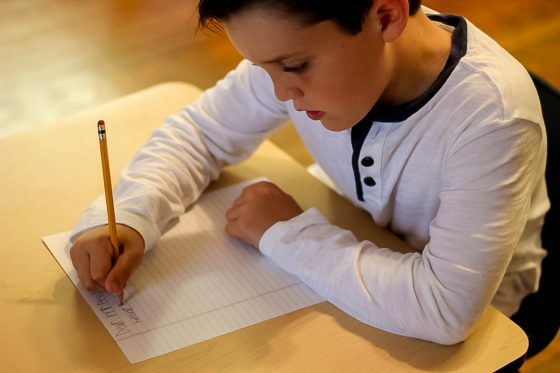 The ability to hold a pencil appropriately and eventually move it in strokes that create letters, numbers, and early drawings all involve muscle movement. In most children, hand dominance will be affected by muscle strength, and one hand will be used more consistently allowing refined skills such as eating or cutting to become more developed. 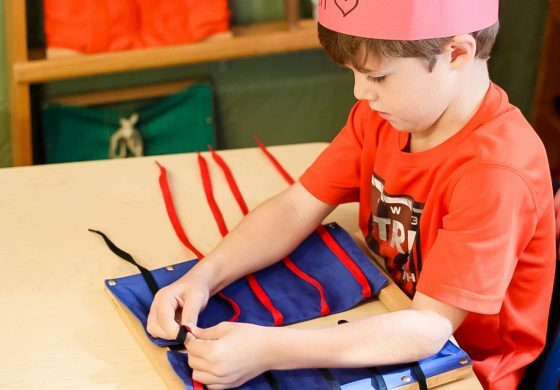 Fine motor skills such as manipulating scissors, building with small pieces, and tying shoelaces all involve the use of upper body muscle groups. All children develop differently, and obviously some will be bigger, faster, and stronger than others simply because of genetics. 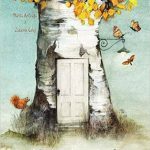 However, rather than comparing one child to the next, even within the family, parents should simply evaluate the skills and abilities of each child individually. 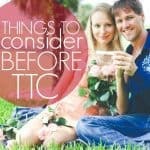 If your tot is happy, healthy, and playing with age appropriate toys, they are most likely developing just fine. 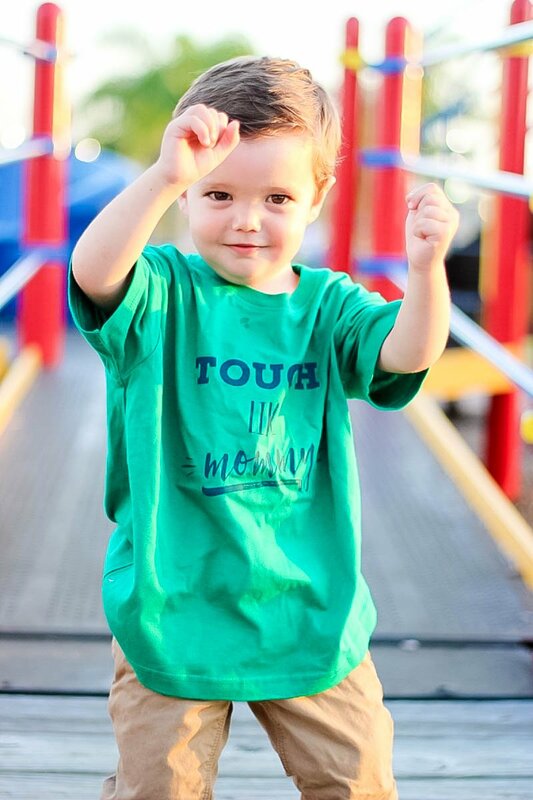 Working exercise and strength training into play is just something that may help your child moving forward and is a great habit to instill. 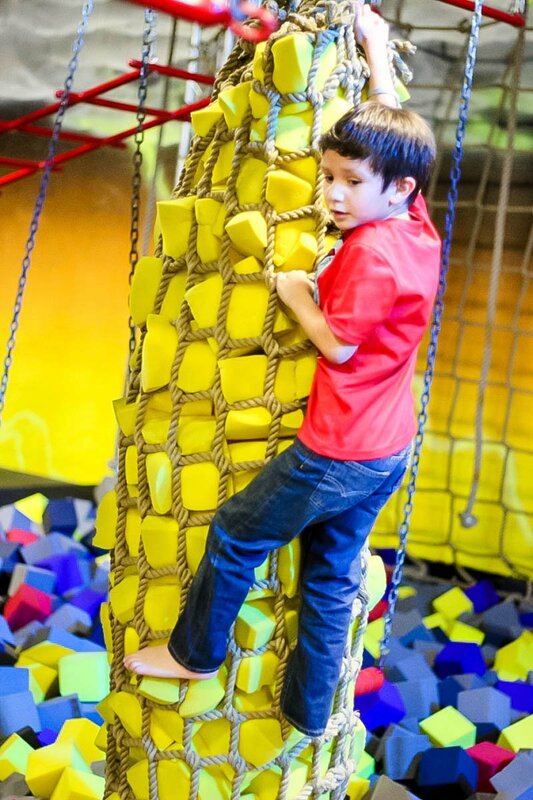 It is doubtful that any child will protest play, and just a simple bit of encouragement will ensure they will try harder, strive to climb that rock wall, or swing from that trapeze bar, guaranteeing some muscle development in the meantime. 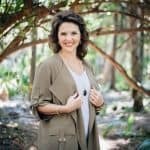 For more ideas on working out with the kids, check out the Thrive Section at Daily Mom.